San Cristobal, Mexico, January 1st 2006 -Deep in the Mountains and jungles of Chiapas, populated primarily with indigenous peasants, stirs a force which is seeking to upstage the high financed drama of the 2006 Mexican presidential election. The force grows out of rebel occupied territory held by the EZLN, commonly known as the Zapatistas. The Zapatistas control five regions in Chiapas. Each of these regions includes many small villages, containing a total population in the tens of thousands. Since an armed uprising launched on January 1st, 1994 (the day NAFTA went into effect) these communities have been administered autonomously, guided by humanitarian principles, and utilizing directly democratic decision-making structures at a local level. Their autonomy stems from a shaky cease fire agreement with the Mexican government which has more or less been in effect since the mid-nineties, and is guarded by a standing rebel army estimated to be in the thousands. However, over the course of the last five years the EZLN, who have political aspirations far beyond Chiapas, has found itself more and more isolated from the larger, but fragmented, Mexican left. This isolation has greatly hampered Zapatista attempts to expand their practical influence beyond their few rural strongholds. In a bold attempt to break free of their current limitations, the General Command of the EZLN issued in June a communiqué known as the Sixth Declaration From The Laconda Jungle announcing a national initiative aimed at uniting the entirety of the non-electoral Mexican left. The initiative, which will consist of Subcommandante Marcos (the most prominent EZLN figure) and other Zapatista leaders traveling throughout the nation in order to speak with and listen to hundreds of grassroots organizations and thousands of working people, is being called the Other Campaign. According to EZLN spokespeople, the basic goal of the campaign is to begin to foment a united left platform, strategy, and bottom up organization based on the opinions, experiences, and needs of the majority of the Mexican people. For the EZLN such an effort is necessary if the needs of the estimated 80% of Mexicans who are currently living in poverty are to be fundamentally addressed. The announcement of the Other Campaign, timed to coincide with the 2006 Mexican presidential race and set to begin with a march and mass rally in San Cristobal on January 1st, has been met with both excitement and trepidation throughout the country. Although the EZLN has stopped short of calling for a boycott of the national elections, many liberals fear that their condemnation of the PRD will tip the polls in favor of the center-right National Action Party (PAN), or the Institutional Revolutionary Party (PRI) –which is also on the right. At present, Andres Manuel Lopez, former Mayor of Mexico City, of the PRD, maintains an eleven-point lead in the polls over his closest rival, Roberto Madrazo of the PRI. 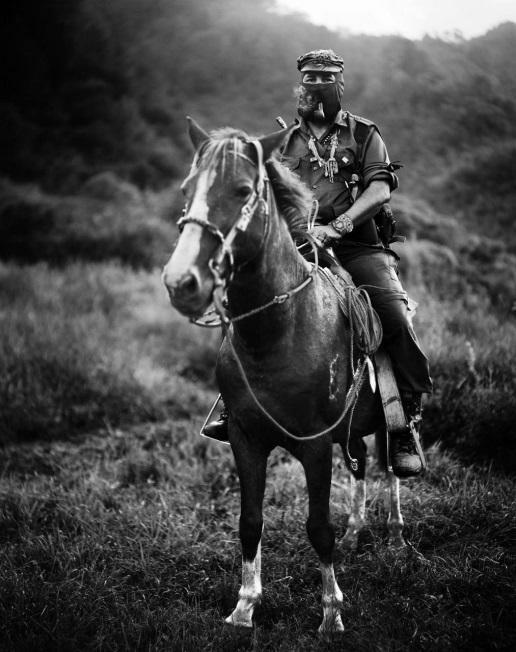 In addition to the debate about the EZLN’s potential effects on the presidential race, speculation has surfaced that Subcommandante Marcos and the EZLN are trying to transition away from their role as armed revolutionaries, and are setting themselves up for an electoral campaign of their own in 2012. These are charges that the EZLN deny. The following day, an estimated one thousand masked Zapatistas embarked from La Garrucha to San Cristobal (a city which was briefly held by the EZLN in 1994) where the Other Campaign would be officially launched. Leading the caravan was Subcommandante Marcos, riding a motorcycle. Thousands more Zapatistas made their way from other EZLN communities. Along the route whole indigenous towns, men, woman, and children, turned out along the roads to wave, cheer, and sing songs of support for the Zapatistas and their cause. The caravans converged on San Cristobal just as night set in. There, over 15,000 Zapatistas marched in four lines through the streets of the city. Chants of “Viva Zapata! Viva La Zapatista! Viva La Revolution! Long Live Zapata, The Struggle Continues!” rang through the cool night air. The march emptied into the city’s main square. The crowd grew to an estimated 20,000. Taking the stage were a number of Zapatista leaders. One after another called for all of Mexico’s working people and farmers to unite against their common enemies and build a new kind of power outside the confines of traditional politics. The crowd roared in applause. For the moment an unmistakable feeling of optimism filled the air of this old Mexican city. However, it will be a long road before the Zapatistas can claim victory over the traditional political forces that are entrenched in Mexican society. That road will take EZLN leaders to all corners of the nation over the course of the coming year. What will come from this campaign is yet to be written. Article first published in the Vermont Guardian, Upside Down World, at Catamount Tavern News, 2006.